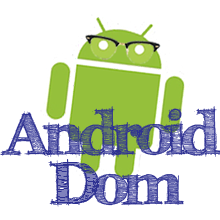 This article will demonstrate how to display a pop up dialog (AlertDialog) in Android. Be sure to check out part 2 when you are done. Sometimes you want to be able to quickly display a small amount of information to the user. Pop up dialogs are perfect for doing this. The user can see and interact with a small message, without being driven too far away from the main activity. However, make sure you don't go overboard with your use of pop up dialogs. If you are trying to display a lot of information they can be ugly looking, and users could become annoyed if too many of them start showing up. First lets create a simple layout for our demo app. Our layout will consist of only a button. When you press this button, the pop up will appear. Listed below is the complete source for the layout. Now, lets create a function that when called, will display the pop up message box. To create a pop up, we use an AlertDialogBuilder. The builder allows us to set a number of parameters. After they have been set, we use the builder to build the dialog so we can then display it. It is important to note that the create method of the AlertDialogBuilder does not show the dialog. You must remember to call the Show method. The code for this function is listed below. Now we will add an OnClickListener to the Show Pop Up button which calls the function we just created. This code is listed below. Now run the program, and press the button to display your Pop Up. The complete source for the activity is listed below. 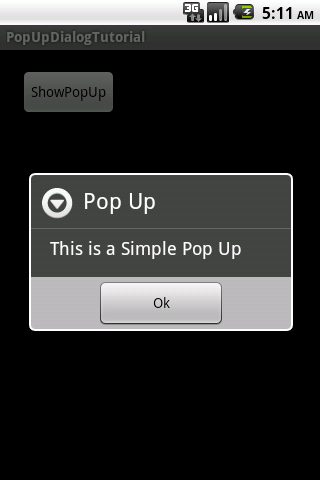 It is possible to create more advanced Pop Up dialogs. For example, you can use a pop up dialog with a custom layout. Be sure to check out part 2 to continue learning. in the comments where it says it does nothing but it did not work. Any suggestions?